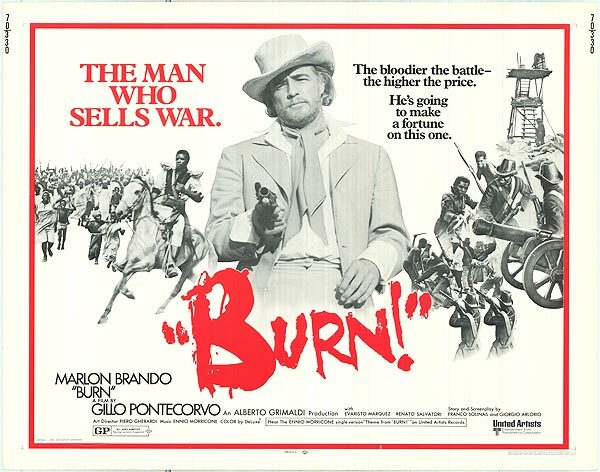 Spaghetti Cinema: Marlon Brando Threatens To Walk Off BURN. "Gillo was a handsome man with dark hair and beautiful blue eyes who came from a family of diverse accomplishments; one brother, he told me, had won the Stalin Peace Prize, another was a Nobel laureate, and his sister was a missionary in Africa. "Despite his warehouse of superstitions, Gillo knew how to direct actors. Because I didn't speak Italian, and he spoke little English, we communicated mostly in French, though a lot of it was nonverbal; when I was in a scene, he'd come over and with a small gesture signal 'A little less,' or 'A little more.' He was always right, though he wasn't always clever about knowing how to stimulate me to achieve the right pitch. He was a good filmmaker, but he was also a martinet who constantly tried to manipulate me into playing the part exactly as he saw it, and often I wouldn't go along with what he wanted. He approached everything from a Marxist point of view; most of the people who worked for him thought this dogma was the answer to all the world's problems, and some of them were sinister. They were helpful to Gillo, but I didn't much care for them. Some of the lines he wanted me to say were straight out of the Communist Manifesto, and I refused to utter them. He was full of tricks. If we disagreed, he sometimes gave in, then kept the camera running after saying 'Cut' hoping to get me to do something I refused to do. In one scene I was supposed to toast Evaristo Marquez, the actor playing a revolutionary leader who was my foil and the hero of the picture, but Gillo didn't want me to sip from my drink after the toast; I was to spill my wine onto the ground as a snub while Evaristo sipped his. At that moment in the picture this gesture did not seem to me to be consistent with my character, and so I refused to do it; I wanted to really toast him. Gillo let me do it my way, then kept the camera turning after the take was over and got a shot of me throwing my drink on the ground because I thought we had finished the shot. When I saw the picture, this was the shot he used. "In another scene on a very hot day, when I was wearing only shorts and a jacket for a shot above the waist, Gillo wanted me to say something I didn't want to say and made me repeat the scene over and over, thinking that he would finally exhaust me and I'd do what he wanted. But after about the tenth take I realized what was going on and asked the makeup man to get me a stool. I strapped it to my rear end and continued doing the scene my way, then after each take lowered myself onto the seat and pretended to be reading The Wall Street Journal, which Gillo detested as the symbol of everything evil. After scores of takes, he finally gave up; I'd worn him out. "Most of our fights were over the interpretation of my character and the story, but we fought over other things, too. Gillo had hired a lot of black Colombian extras as slaves and revolutionaries, and I noticed that they were being served different food from the Europeans and Americans. It looked inedible to me and I mentioned this to him. "But the real reason, a member of the crew to me, was that Gillo was trying to save money; the food he was giving the black extras cost less. Then I learned that he wasn't paying the black extras as much as the white extras, and when I confronted him about it, he said that if he did the white extras would rebel. "Gillo said that he agreed with me, but he couldn't back down; in his mind the end justified the means. "I went to the airport at Barranquilla and was about to get on a plane for Los Angeles when Gillo sent a messenger with a promise to equalize the pay and food."